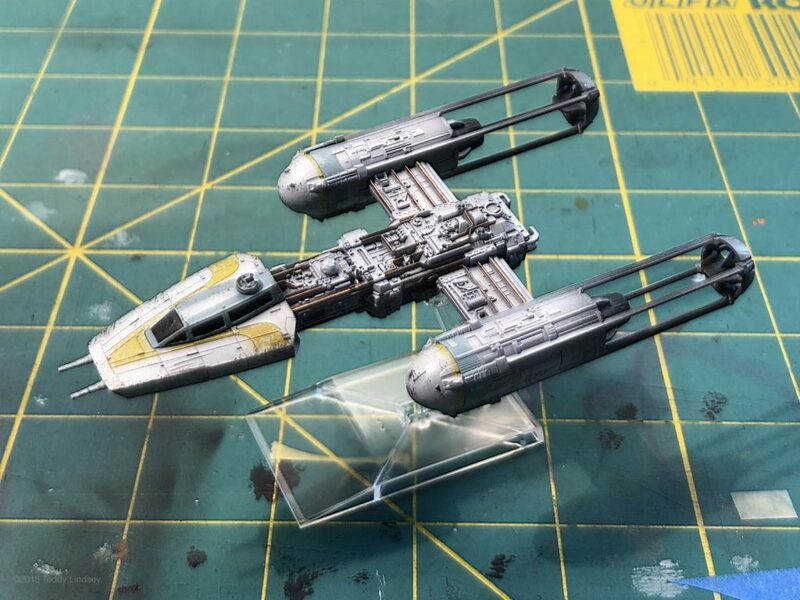 This is a 1/144 Y-Wing from Bandai’s Star Wars Episode IV, V and VI vehicle range. 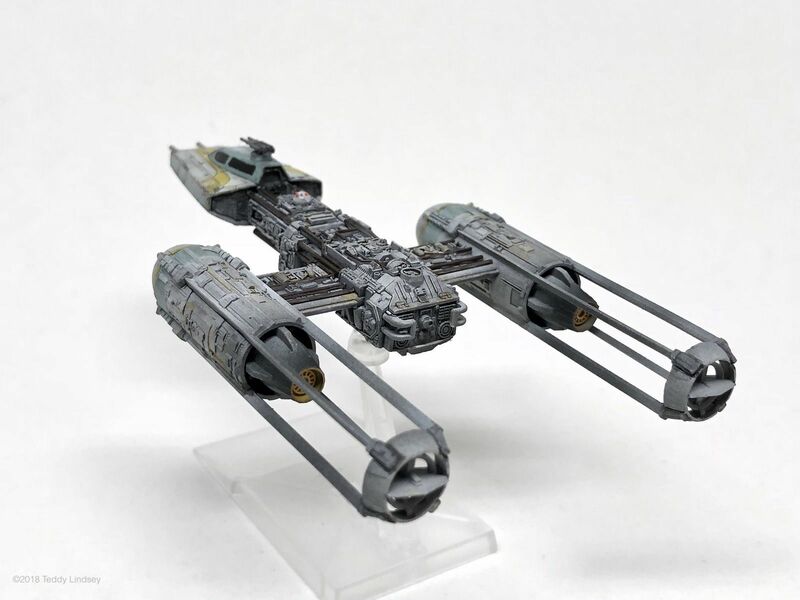 It came as part of a boxed set with an X-Wing and Y-Wing. 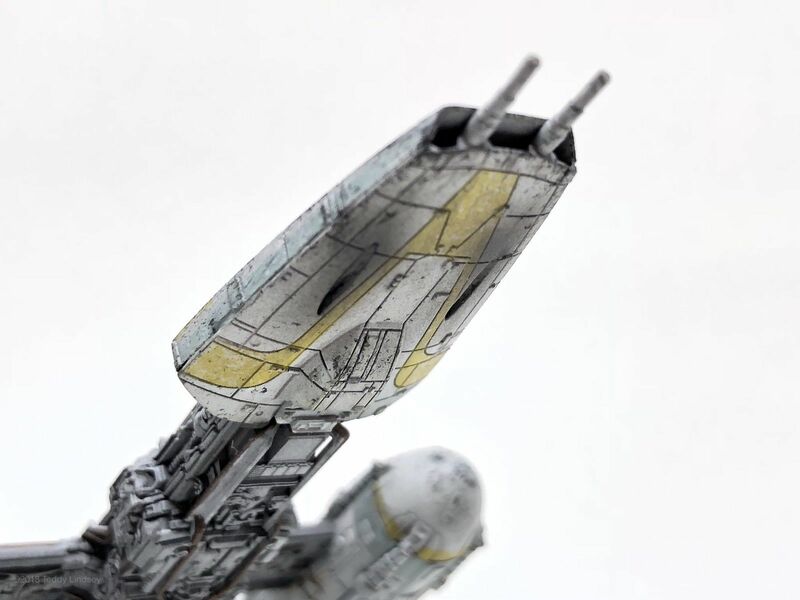 The level of detail is remarkable, especially for a model in this small a scale. 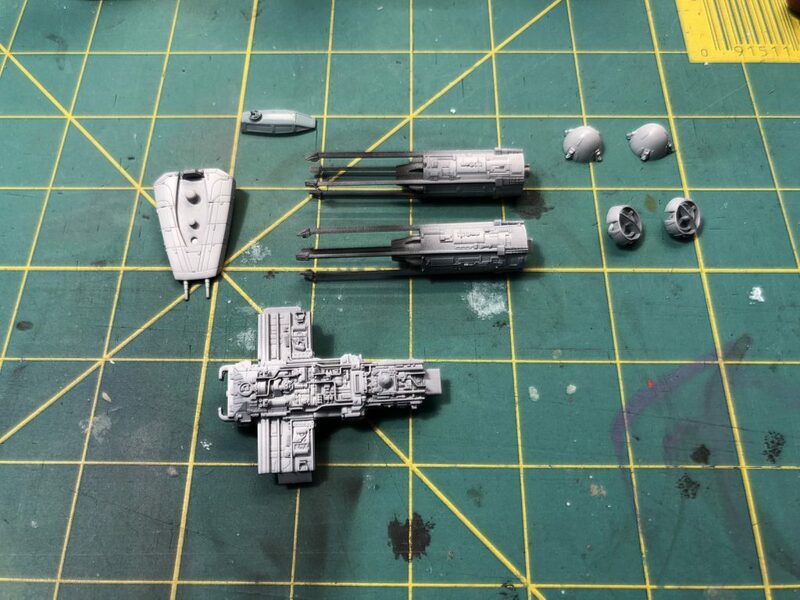 The kit parts fit together quite snugly without glue and Bandai has done a great job at hiding mold lines and joins. The kit also comes with a set of stickers rather than decals for the hull markings, stripes, etc. 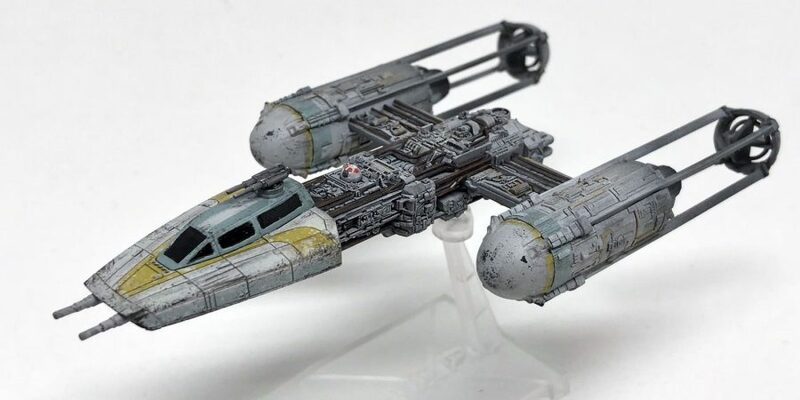 I chose not use the stickers since they would obscure the incredible detail of the model, opting to paint the markings by hand. 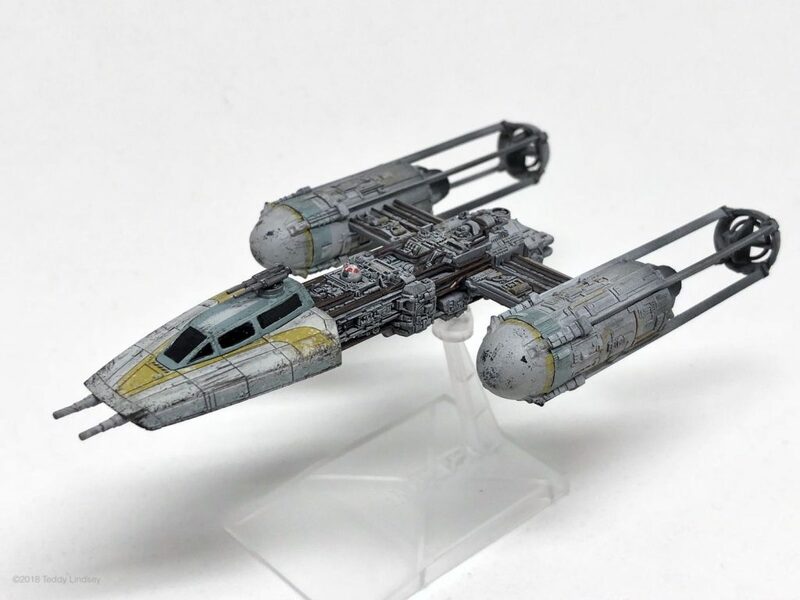 I started out with a base coat of Stynylrez Gray Primer followed by Minitaire Dusty Ground for the white hull color. I applied Tamiya XF-85 Rubber Black onto the engine vanes for the carbon staining from the engine exhaust. The cockpit is Tamiya XF-23 Light Blue. 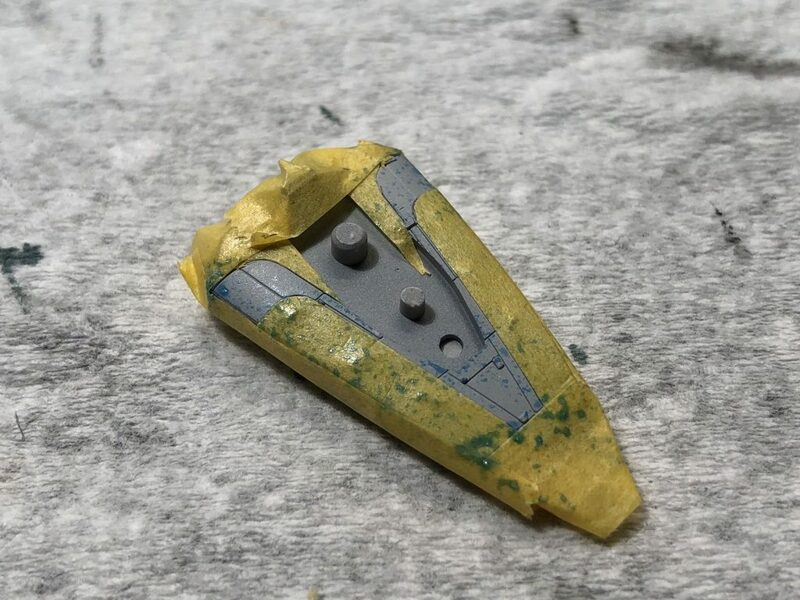 Next came masking for hull stripes using a mix of tape and masking fluid for paint chipping. The Microscale Masking Fluid was applied with a torn sponge and is probably better suited to larger scale models. 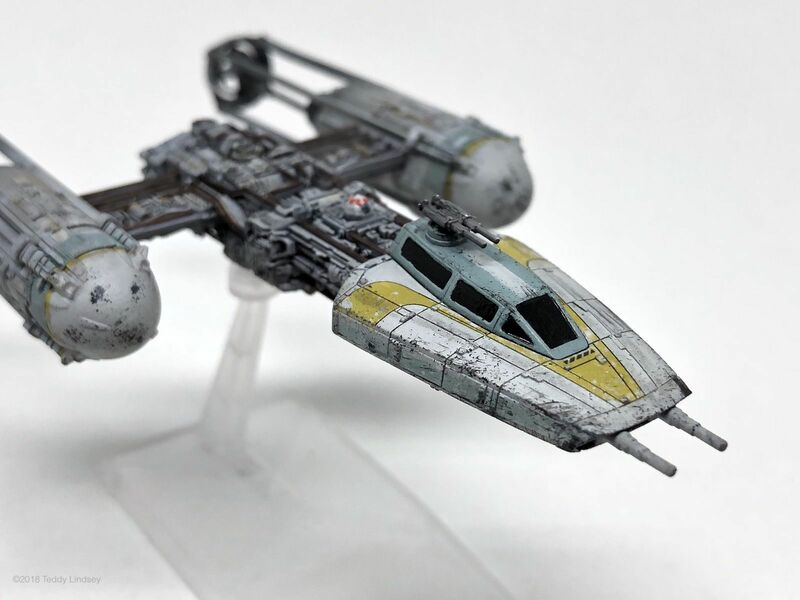 The yellow hull stripes were from a 30-year-old bottle of Tamiya XF-4 Yellow Green which gave me a nice desaturated hue. I then used a sponge to apply scuffs and scratches with Vallejo German Gray and Black. It was difficult to get properly scaled scuffs at this scale. 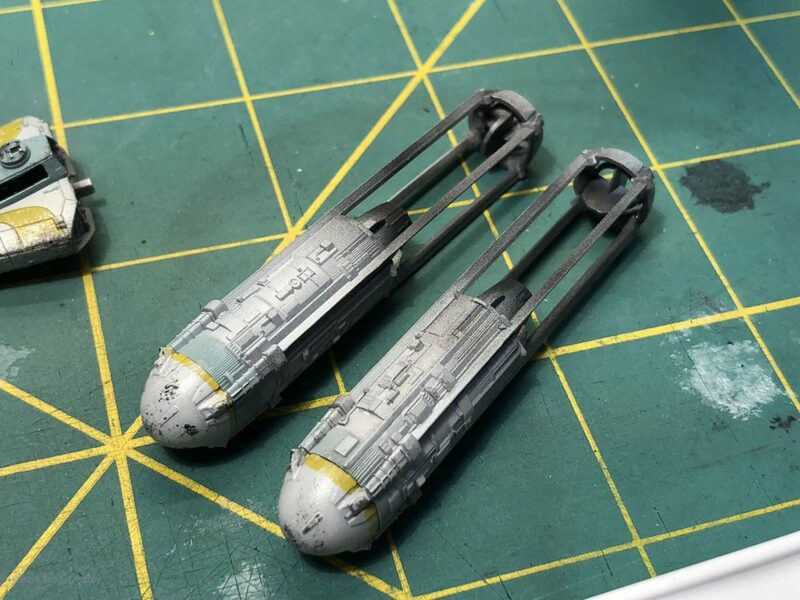 I painted a number of the pipes on the main hull using Vallejo Tinny Tin which gave the pipes a warmer, coppery color, somewhat different than the rusty pipes I’ve seen on some Gold Squadron Y-Wings. Next came a coat of Army Painter Satin Varnish to seal the base coats in followed by a filter across all the entire model to pick out details using diluted Vallejo Dark Gray Model Wash. Certain spots received additional darkening using GW Nuln Oil and scorch markings near the proton torpedo tubes were airbrushed on with XF-85 Rubber Black. 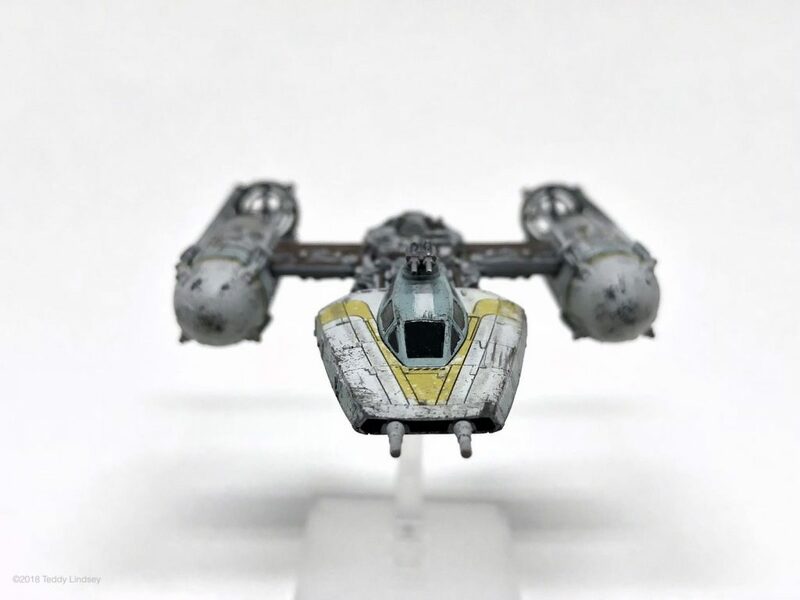 The R2 unit behind the cockpit is pretty tiny and painting the red color panels on its head was tricky. The exhaust guides are rotated 90° from the correct position. Oops. Overall, really fun little kit with great details and precise fit. 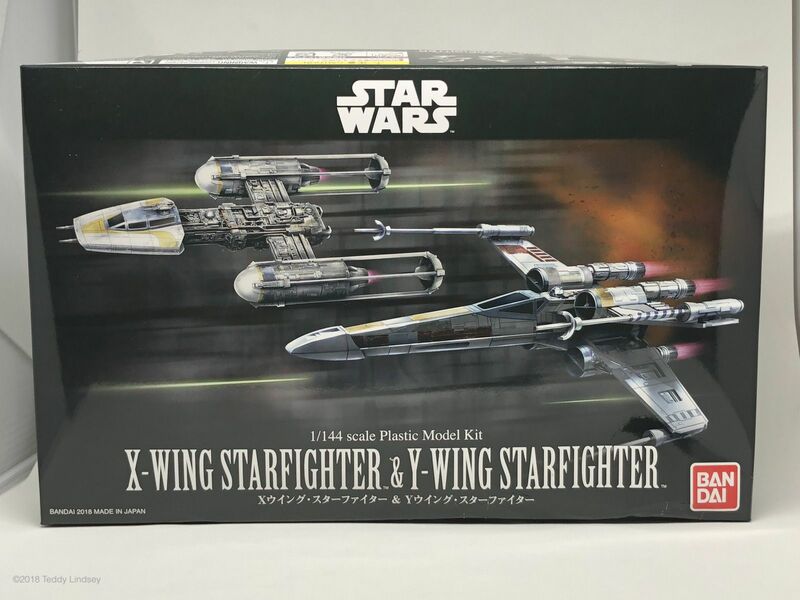 Looking forward to working on the X-Wing from the same box next.